Since adoption, the Town has piloted a number of the recommendations, resulting in traffic and parking changes. The Town has begun a project that will help utilize private parking stalls for public use. The Banff Lake Louise Hotel Motel Association indicated some of their members had parking stalls that were going unused, and that they would be willing to make them available to the public. Council committed $8,500 to the project, which will pay for temporary parking signage private lot owners can use to direct the public to available spots. It will also provide online advertising of those stalls on banffparking.ca. The Town will also maintain and distribute a registry of private parking stalls for long-term rental. Why not add a fourth lane to the Bow River Bridge? Why don’t you limit the number of cars that cross the Bow River Bridge, similar to the concept of restricting vehicles on the Moraine Lake Road? Why not build a giant intercept parking lot? Why doesn’t the Town build a new parkade? 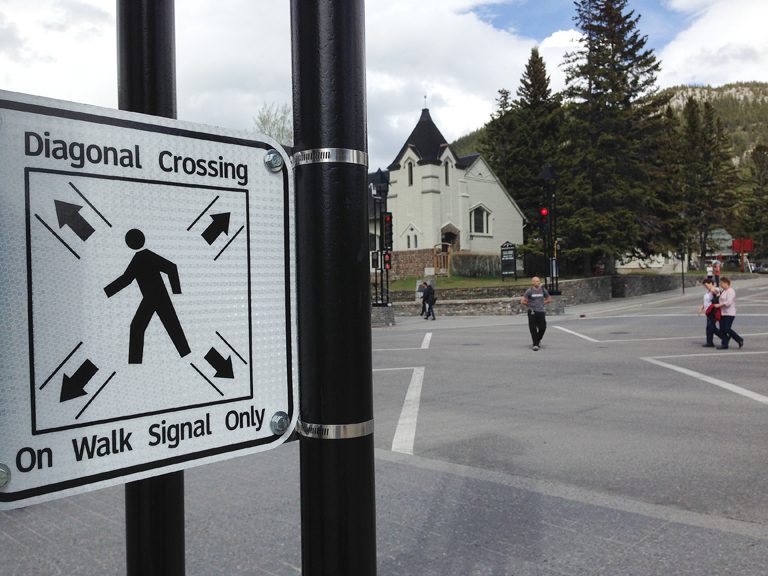 Why have scramble crosswalk intersections?